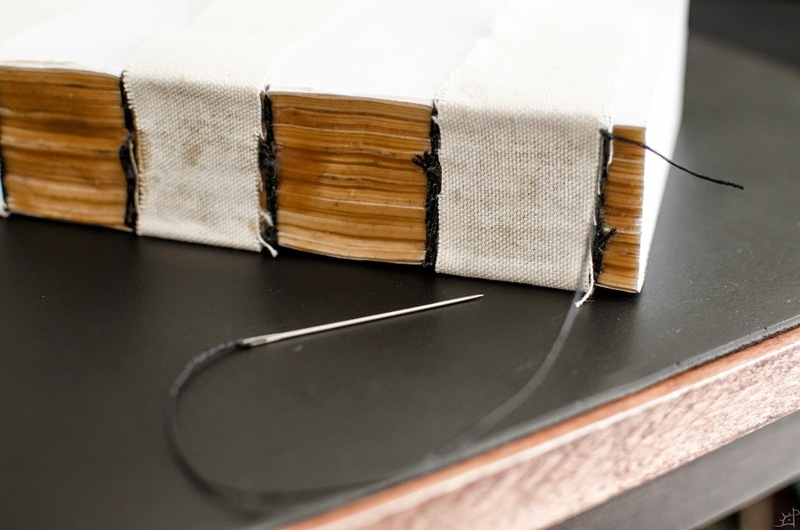 To attach the bound folios to the cover of the book, there are a number of ways that have traditionally been used, everything from threading strings through the edgeboard to the use of screws and spirals, but none of those are very appealing to this particular project. However, to bind the pages to the cover, there is some work that first needs to be done. I am continually surprised by how often unrelated tools surface into random projects. 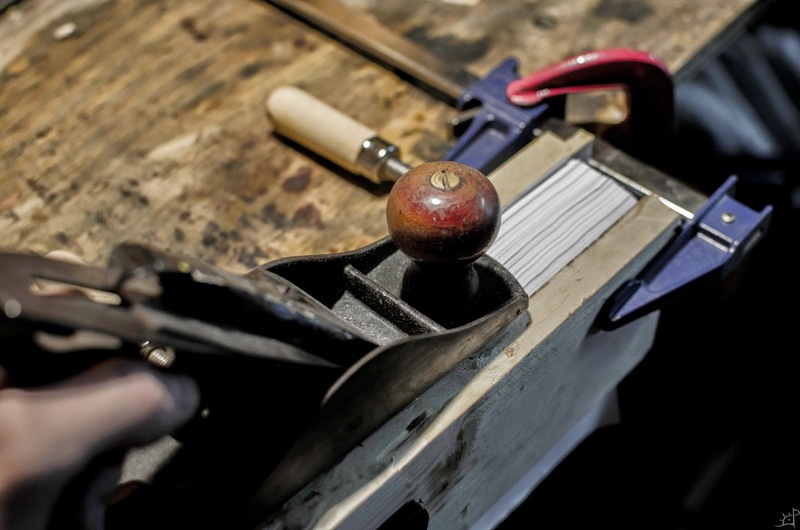 This time, it's a hand plane to trim the edges of the pages now that they are held firmly together. Sharpening the blade took a little work on the stones, but in no time they were ready to shave. Having them as sharp as possible is important for preventing tearout on the corners. 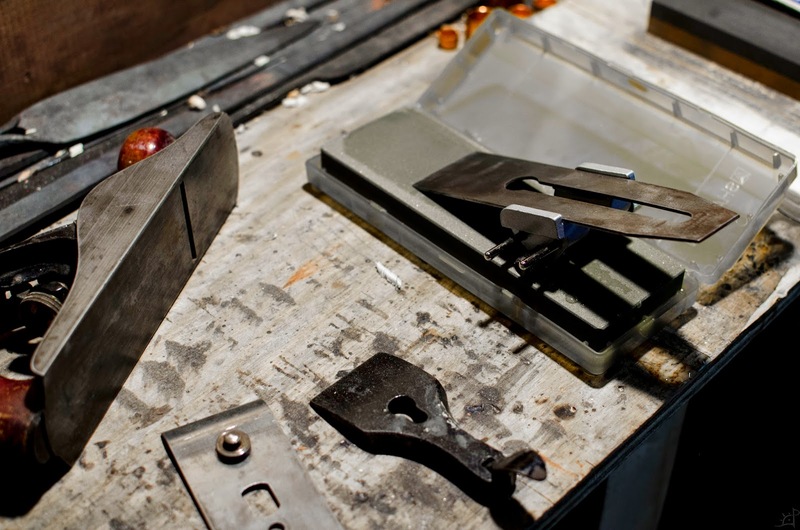 Clamping the book as tightly and squarely as possible between two boards, and then to the bench, it's time to work. I set the boards just proud of the paper which helps keep everything flat and plane. 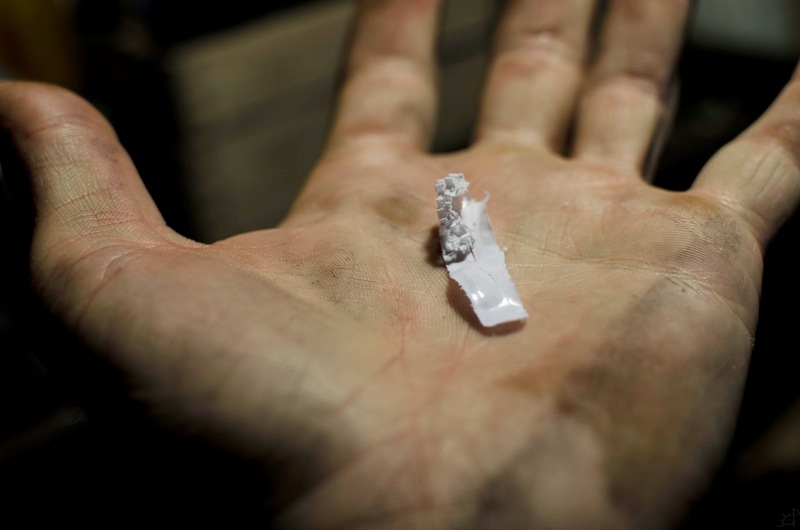 That extra inch of width and rigidity also prevents the softer pages from just bending over. 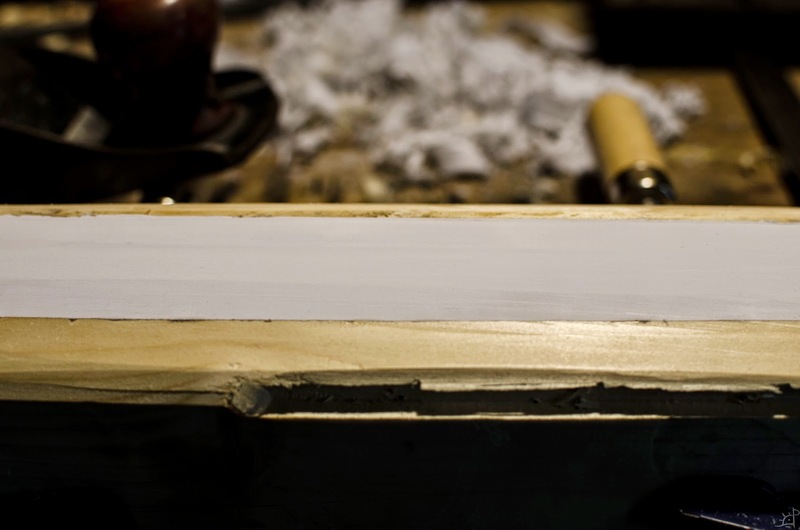 Taking off shavings so thin they are almost translucent, the plane slowly levels out the edges. 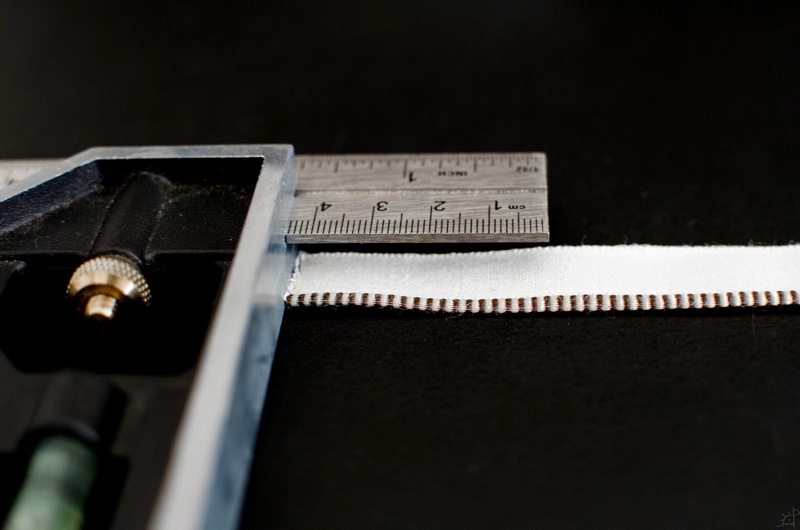 The strange thing is, at such a thin pass, the fibres bind together into a single ribbon that shows no signs that it's actually 400 individual pages pressed together. Before too long, the pages are plane and smooth. Flipping the book around and doing the same to the other two edges (top and bottom), checking for square now and again, it is now ready for mulling and cloth. It should also be noted that the outer long edge should be done first, and on the other two, the plane blade should travel from spine to edge. This keeps the corners sharp and free of half attached dusty fuzz. 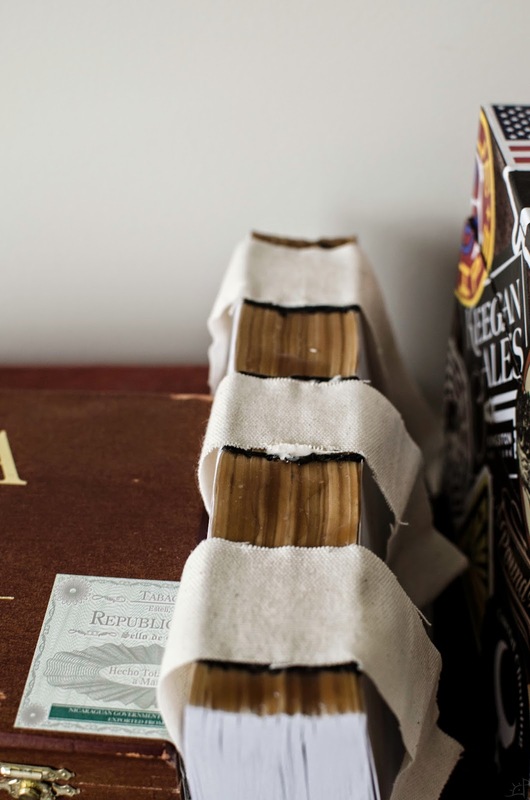 Now then, with the pages bound, something needs to hold them to the covers. 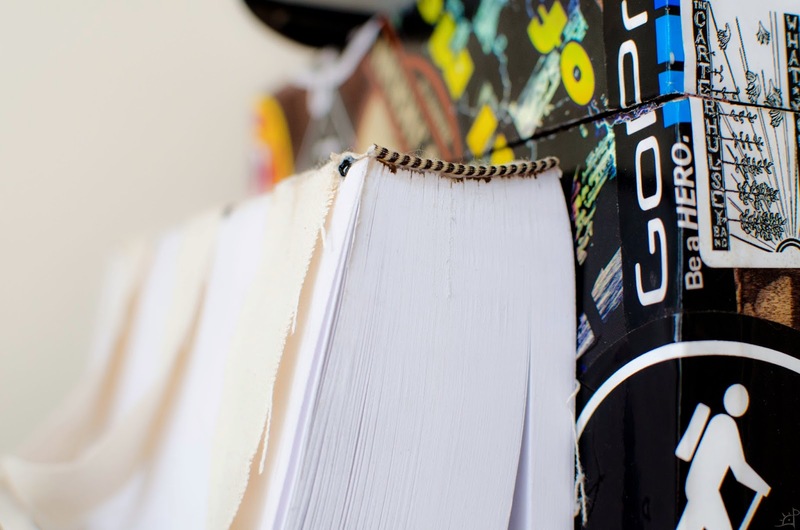 Cloth is a usual medium when other methods are not used, and in this case, the effect will hopefully yield the appearance and strength of regular hardback books. 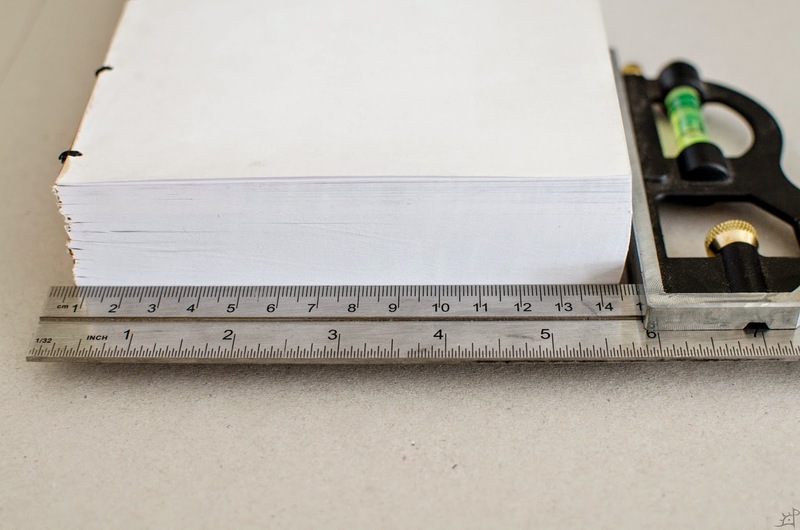 From a bolt of canvass, I cut three strips about 70% the length of the book's circumference and the width of the space between stitches on the spine of pages. Roughly positioning them on the pages shows the orientation a bit clearer. They do not need to be the full length of the pages because that far out, it won't be holding any weight anyway. 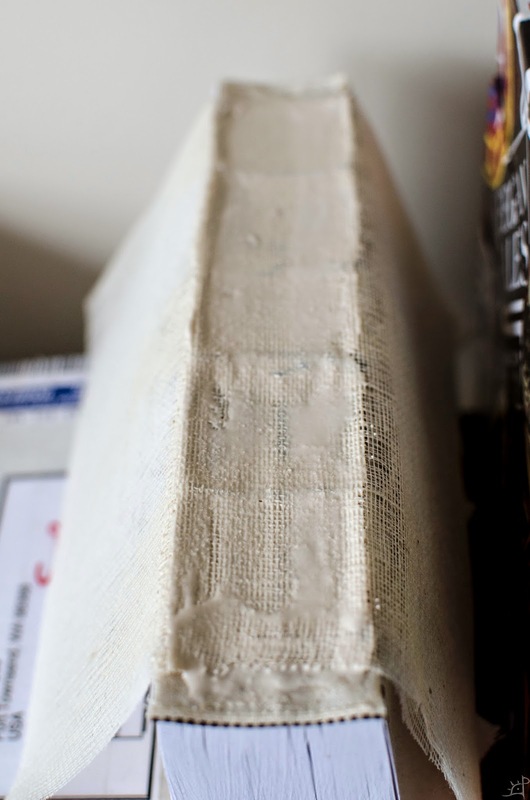 Using the same glue as to bind the spine, each of the three places where the canvass will go is covered with about the same thickness as the strip of cloth. 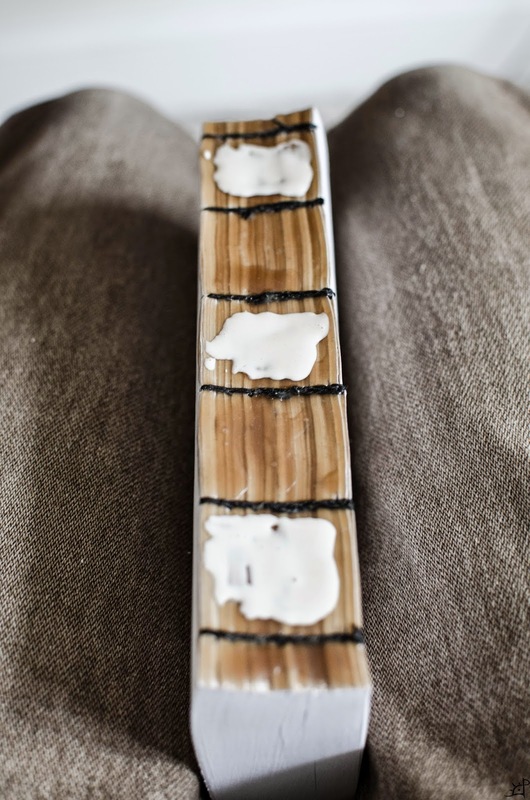 When the cloth was placed over the glue, I pulled it tight and pressed it into the spine, using my fingers to spread it to the edge and make sure there was contact everywhere. After the glue dried for a day or so (this type of PVA glue is not meant to be gap filling and takes a long time to dry in thick application) I took a needle and sewed through the edge along the existing stitch, adding a physical reinforcement to the glue. Next, I added a headband to the top and bottom to mask the unevenness in the pages at the spine. And, in my opinion, it adds a little more legitimacy to the project. 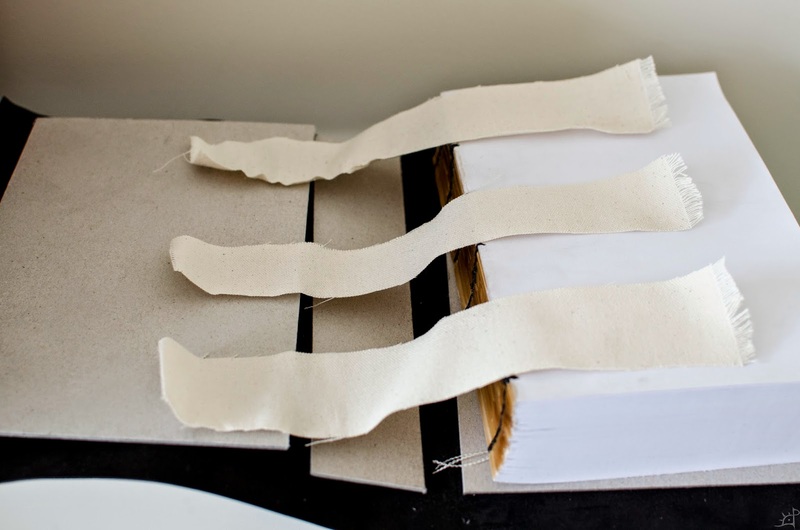 Each of the two strips were cut to the length of the book's thickness and held in place with glue in the same way as the previous strips of cloth. As they won't be seeing any movement or bear any weight, that is more than sufficient. 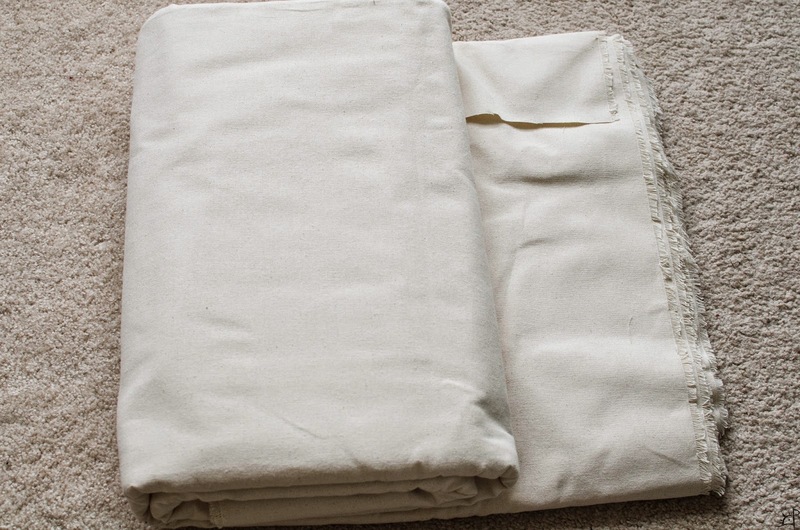 On top of the cloth, a non-stretching mesh called mull is used as extra support to hold the covers on. 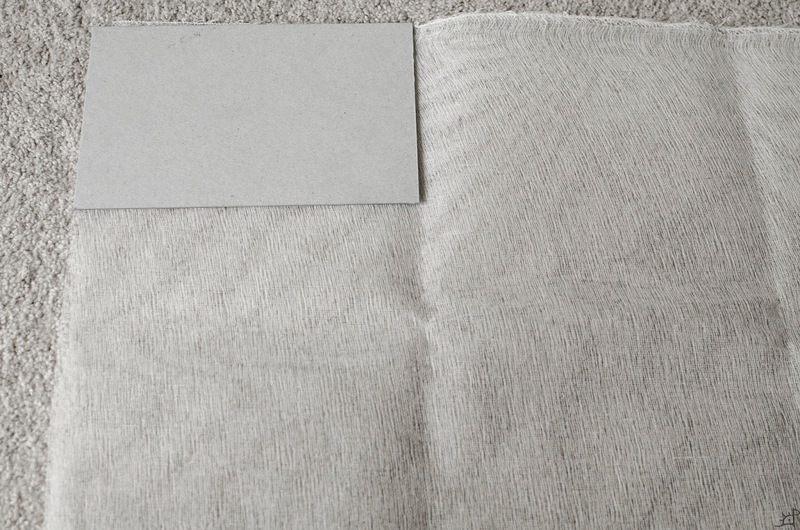 A rectangle long enough and wide enough to just cover the three bits of cloth is all that's needed, but I used twice the thickness (pictured) because the weave is so loose. To hold it onto the pages, I just used a little glue, much like I do when binding sheetrock tape to the back of a bow. It takes a little patience to keep it stuck before drying, but once the glue becomes a bit more tacky it holds well enough. 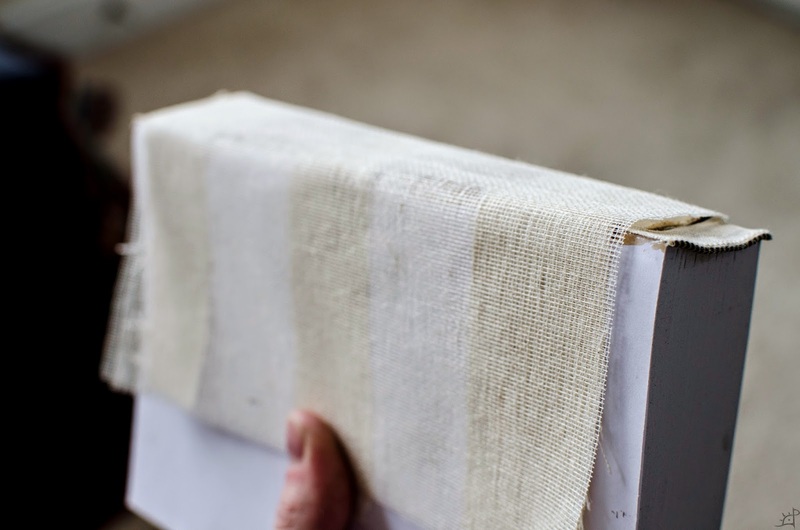 As with the cloth, the glue is laid down first and the mull pressed into it, wiping it to the edges and pulled down along the corners. Next up is making the cover, gilding the edges, and binding the cover to the book.